Bonds rose Thursday as the yield on the benchmark 10-year U.S. Treasury note briefly fell below the psychologically important 3 percent mark for the first time since September before ending around 3.03 percent. This was largely due to comments by Federal Reserve Chairman Jerome Powell a day earlier that interest rates are “just below” neutral, which traders took as a sign the central bank is close to ending the current rate-raising cycle. 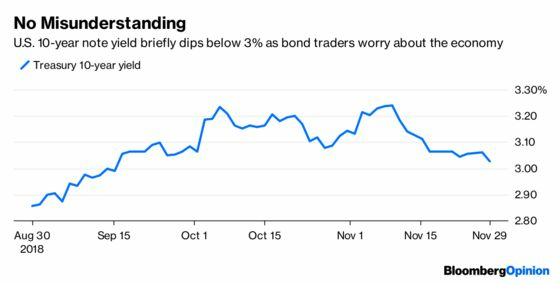 Given the strong track record of bond traders over many years, it’s hard to say they misunderstood what Powell said or was trying to say, but that didn’t stop a surprisingly large number of economists from trying to make the case they got it wrong. Given the strong labor markets, “we run the risk of returning to 1970s-style unanchored wage inflation with an associated bear market in both bonds and equities” if the Fed doesn’t try to cool growth with more rate increases, Torsten Slok, Deutsche Bank’s chief international economist, wrote in a research note that was fairly typical. 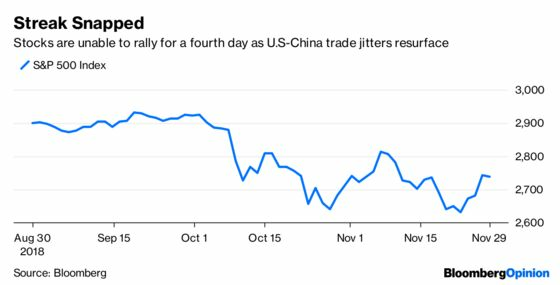 Perhaps, but bond traders are clearly more worried about signs of slower growth not just in the U.S. but globally, pushing 10-year yields down from more than 3.20 percent just three weeks ago. S&P Global Ratings said Thursday that it sees a 15 percent to 20 percent chance of a recession in the next 12 months, up from 10 percent to 15 percent. The International Monetary Fund downgraded its forecast for world growth last month, and Managing Director Christine Lagarde warned this week that the outlook might have become even worse. And rather than accelerating, inflation appears to be decelerating. Government data Thursday showed that the core personal consumption expenditures index, which is the Fed’s preferred measure of inflation, rose just 1.78 percent in October from a year earlier, the smallest increase since February. It’s not just in the U.S. that confidence in higher interest rates is faltering. Bond and money market traders worldwide are reassessing the pace of monetary policy tightening amid signs global growth is sputtering, according to Bloomberg News’s Stephen Spratt. The European Central Bank’s long-anticipated rate increase is looking less likely, while the probability of moves in Canada and Australia have been pushed back. It has been more than 24 hours since Powell’s speech, giving bond traders more than enough time to parse the comments. It’s not that they misunderstood him, but rather understood quite well. U.S. stocks were unable to complete their first four-day rally since September. But more important, remember when the big corporate tax cuts pushed through by the Trump administration at the end of 2017 were supposed to unleash a flood of economic activity not only this year but well into the future? The cynics said companies would just use the savings not for building plants and buying equipment to expand but rather to reward shareholders through dividends and stocks buybacks. It turns out the cynics were right. Companies in the S&P 500 Index have paid out an aggregate $420.7 billion to shareholders as dividends this year, beating the record full-year total of $419.8 billion for 2017, according to Bloomberg News’s Richard Richtmyer, citing data from S&P Global Ratings. As for capital spending, nonresidential business investment rose just 2.5 percent in the third quarter, the smallest increase since the final three months of 2016, according to Bloomberg News’s Shobhana Chandra and Liz Capo McCormick. That leads to a big question regarding equities markets: Can stocks can really rebound if companies are not showing much confidence in the outlook for their businesses and industries? After all, rising dividends and buybacks won’t boost valuations. Canaccord Genuity equity strategist Tony Dwyer, who previously forecast the S&P 500 ending next year at 3,360, compared with around 2,738 at Thursday’s close, has said he’s reconsidering that view. As of Wednesday, strategists on average expected the S&P 500 to reach 3,052 by the end of next year, according to 12 estimates tracked by Bloomberg. Trading currencies is hard, probably more so than anything else in financial markets. For proof, just look at the Citi Parker Global Currency Index, which tracks nine distinct foreign-exchange investment styles. The measure was down 1.99 percent in November through Wednesday, heading for its worst monthly loss since June 2015. The index is now down 3.60 percent for the year, virtually guaranteeing a fourth consecutive annual decline. In an increasingly globalized economy, the old textbooks that once taught how exchange rates were largely set by interest-rate differentials among countries and trade flows are largely irrelevant. Now, there is a seemingly infinite number of variables that traders must consider, including equity flows, direct investment, valuations and investor sentiment, GAM Holding AG group chief economist Larry Hatheway wrote in a Bloomberg Opinion piece earlier this year. 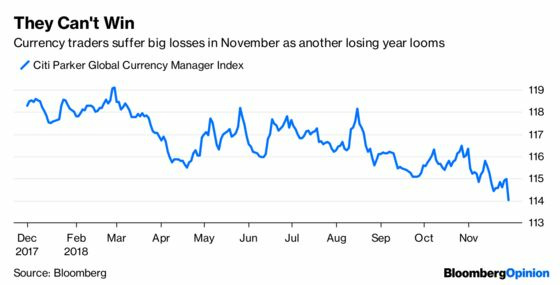 As for November, many currency traders may have gone wrong by betting on gains in the Swedish krona, British pound and New Zealand dollar and losses in the Argentine peso, Russian ruble and Colombian peso. Instead, the krona, pound and so-called kiwi were the biggest losers against the dollar while the two pesos and the ruble were the biggest gainers. Then there’s the dollar. 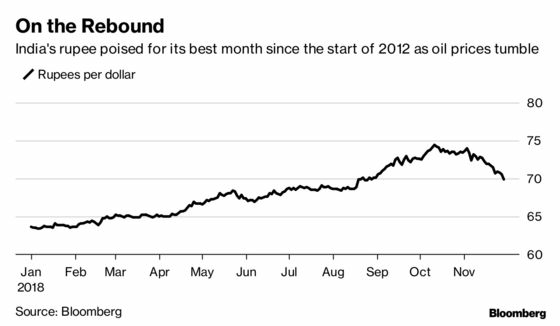 The consensus has been for big gains as the Fed was sounding very hawkish coming into November, but instead the Bloomberg Dollar Index is poised for its first losing month since July as policy makers seem to be leaning a bit dovish. INDIA TURNS A CORNER. MAYBE. Hogs were the big winner in the commodities market on Thursday. Hog futures jumped almost 4.50 percent amid a report that China, the world’s top pork consumer, faces an outbreak of African swine fever and has culled about 600,000 hogs to curb the spread of the disease. An outbreak has been confirmed in 20 provinces and 47 cities since the first reports in August. This is good news for certain American farmers as U.S. pork sales to China surge back to levels before tariffs were introduced. China was the third-largest buyer of pork in the U.S. Department of Agriculture’s weekly data released Thursday. The 3,300 metric ton-purchase was the most since February, a month before China imposed tariffs on U.S. pork, according to Bloomberg News’s Lydia Mulvany and Megan Durisin. “This is a game changer,” said Dennis Smith, a senior account executive at Archer Financial Services Inc. “It gives confirmation that the disease is far worse than what we’ve been told.” Until now, China has abstained from increasing its imports from the U.S. Unfortunately, hogs are a rare bright spot in the markets for raw materials. The Bloomberg Commodity Index, which tracks everything from energy prices to base metals to agriculture products, is down 0.65 percent for November, bringing its loss for the year to a little more than 6 percent. That’s largely due to the collapse in oil prices and declines in the prices of things such as copper, aluminum, soybeans and sugar amid the slowing global economy and an intensifying trade war between the U.S. and China.